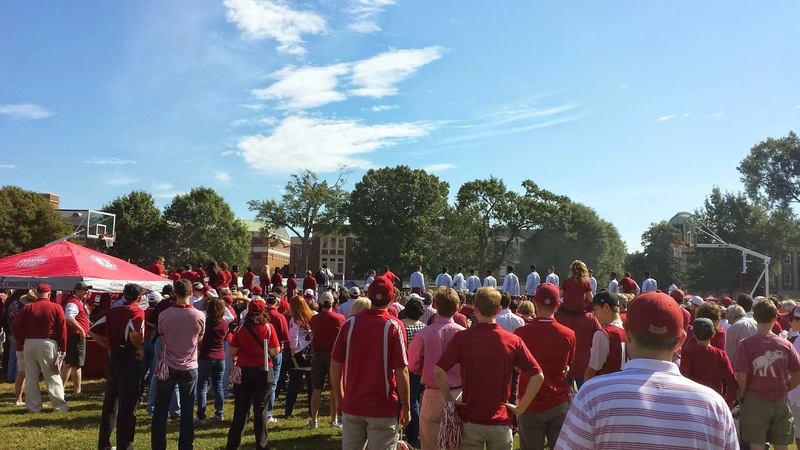 BamaHoops: Hoops on the Quad. The men's and women's team hosted the first ever "Hoops on the quad." First the coaches spoke, introduced the new players and generally talked about how excited they were for the season and encouraged the fans to lend their support. There were a number of competitions where teams consisting of a male and female would compete at scoring from different points on the court and also some dribbling/passing/shooting drills. I was a little surprised there was no dunking competition. There was a 3-point shooting competition, that was won by one of the girl's players with 11 points. Shannon Hale and Levi have the best looking perimeter shot from what I could see. I was disappointed that Norris and Mitchell did not fare better. Norris threw up a couple of air balls, and Shannon, despite having the highest score amongst the men at 10, started things off by hitting the side of the backboard from the corner, twice. To put the low scores into perspective, I won the intramural 3 point shooting contest my sophomore year with a score of 14, and I'm no Steve Kerr. In fairness, these guys aren't used to playing outdoors. The events ended with a short, defense optional scrimmage that featured a lot of ridiculous alley-oop attempts. The weather was perfect and it drew a large crowd from those tailgating nearby for the football game. You couldn't tell much about the team, but that wasn't the purpose of this event. Everybody seemed to have a good time, it was well organized and put together, and perhaps they piqued the interests of some more casual fans. All in all, this was a success and something that should have been done a long time ago. It was nice to see our fearless leader, Bobbyjack in attendance. Hopefully he will post his impressions as well. I plan to attend the annual Tide Pride BBQ/practice Tuesday afternoon and will hopefully have something more substantive to report at that time. Great event!!!!! I think the Freshman were a little nervous (Mitchell, Norris, Coleman, Garrett) however I can see they can play and we are more athletic than past years. Mitchell seems to be more than a shooter he finished over the top of the rim strong. I don't have much to add since I was 20 minutes late and on my 4th Stella. I'm happy for the PR, impressed at the layout, fan attendance, and how both squads made themselves seem approachable. I didn't expect much from the actual scrimmage as it was done to generate the interest of the casual fan (vast majority that found this blog wasn't the target audience).